Decorating for the holidays brings the joy of the season into your home. Unfortunately, accidents often happen during this time of year when people don’t follow proper safety measures in decorating their homes. Follow these five safety tips for holiday decorating to keep your family and friends safe. If you have pets or young children in the home, be aware of decorating with plants. Some commonly used plants are toxic to animals and humans. Poinsettias are beautiful to look at, but curious cats, dogs, and toddlers will get ill if they ingest the leaves. The holly plant makes a decorative accent for mantles, but the red holly berries are poisonous to people and pets. If you decorate with these plants, keep them out of reach from children and pets. Outdoor light displays usually require climbing on a ladder. Ladder safety measures must be included in safety tips for holiday decorating. When the holidays arrive, carefully inspect your ladder before using. Hinges should be tight and rungs firmly attached to the sides. Avoid using the ladder by yourself. Always have someone stand at the bottom to hold the ladder steady. Don’t stand on the top rung, and make sure the ladder extends at least 3 feet above the roof’s edge. Candles are popular for decorating during the holidays, but burning candles present a fire hazard. Don’t leave pets or children alone in a room with burning candles; especially taper and pillar candles. Stay away from decorative candle wreaths because they can catch fire when the candle burns down. For a safer option, always use jar candles or battery-powered candles. The fireplace adds ambiance and warmth to your home during the holidays and it’s important to follow these fireplace safety tips. Before the holidays, have your fireplace cleaned and inspected by a chimney sweep company. This will rid fireplace walls of accumulated creosote and soot that could catch on fire. Before you light each fire, be sure that the fireplace flue is open. Burn only natural materials like untreated, dry wood. Your holiday tree and/or presents should not be near the fireplace. 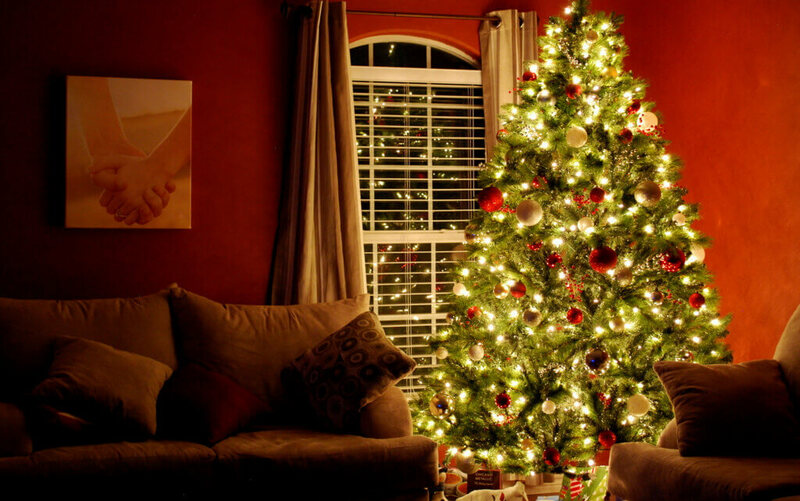 If possible, keep the tree on the opposite side of the room from the fireplace. Close the glass doors to the fireplace while you have a fire burning, and if you don’t have glass doors, install them. For most families, the tree is the centerpiece of holiday decorating. Keep your tree safe by practicing these safety tips. Check water levels daily to make certain your tree doesn’t dry out. Dry trees are more flammable and can become fire hazards. Before hanging any string lights, carefully inspect them for frayed wires and broken sockets. Make sure each socket has a working bulb in it. Always turn the tree lights off when you go out and when the family goes to bed. All these safety measures are simple to implement in your home. These five safety tips for holiday decorating are just some of the ways that you can protect yourself and your family while enjoying the holidays. Happy Holidays from Cal Home Inspection! We serve the Greater Sacramento area with home inspection services.